Yesterday I posted all about appreciating what I have and being more gracious. 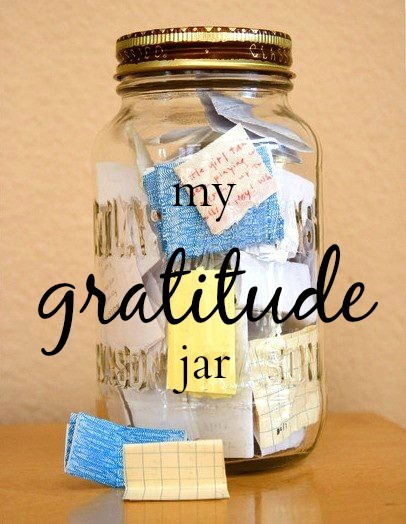 Thenn, I found a post on Tumblr about a gratitude jar and just fell in love with the idea. It's simple and easy I think the end result will be super fun. All you have to do is get a big jar and every time something good happens to you you write it down and put it in the jar. On New Year's Eve you open up all the little papers and read them to remember all the good things that happened during the year. I think it's such a neat way to remember 2014 while keeping things in perspective about how great your life really is when it comes down to all the little things. This is my jar. I made it back in high school for a project and it just seemed perfect for this! I put all sorts of things about me or what I wanted to be and I still love it to this day. It was super easy to make and all you need is a jar, magazines, glue, and paper! Cut out quotes you like and pictures that represent what you want your year to look like and you're set. I'm really going to try to stick to it and hopefully in my 2014 roundup I'll be able to share some with you! Have you ever done something like a gratitude jar or journal? Yes, you definitely should! If you decorate it and all that I'd love for you to tweet me a pic @sarahsmileblog! I tried doing this last year, even wrote a blog post about it. Reality as i often do and get bored with things and forget about them, this idea didn't last longer than 2 weeks around me haha. Thank you, I'm going to try my hardest! How strong is it to hold an writing services on any kind of assignments running? I approve any of these services later watching the kind of process they stage. I am authentic it grabs a multiple of process to guard all so splendid. I would want to strive it sometime.